Adiga burst onto the literary scene with his debut novel, The White Tiger, which went on to win the coveted Booker Prize. He was hailed as fresh voice which reflected a new, gritty, contemporary India. Now in Selection Day he tells the story of two brothers, Manju and Radha, who live in the slums of Mumbai and are being raised by an obsessive, domineering father to become cricket stars. As the boys' father trades on their talent for a step up in life and they come of age, we are immersed in the the social strata of changing India and the result is a bighearted, funny, incisive tale. From Aravind Adiga, the bestselling, Booker Prize-winning author of The White Tiger, a “ferociously brilliant” (Slate) novel about two brothers in a Mumbai slum who are raised by their crazy, obsessive father to be star cricket players that “offers the sound of a serious and nervy writer working at the top of his form” (The New York Times). Aravind Adiga’s “voice is so exuberant, his plotting so jaunty, that the sadness of this story feels as though it is accumulating just outside our peripheral vision” (The Washington Post). It is, simply, “extraordinary” (The Atlantic). “Selection Day, Mr. Adiga’s third novel, supplies further proof that his Booker Prize, won for The White Tiger in 2008, was no fluke. He is not merely a confident storyteller but also a thinker, a skeptic, a wily entertainer, a thorn in the side of orthodoxy and cant... Powerful... Soulful... What this novel offers is the sound of a serious and nervy writer working at near the top of his form. Like a star cricket batter, Mr. Adiga stands and delivers, as if for days." "The best novel I read this year... In its primal triangle of rival brothers and a maniacal father, hell-bent on success in cricket in India, Adiga grips the passions while painting an extraordinary panorama of contemporary sports, greed, celebrity, and mundanity. As a literary master, Adiga has only advanced in his art since his Booker Prize-winning The White Tiger." "A compelling tale of cricket and corruption... A finely told, often moving, and intelligent novel... Adiga has grown in his art since his Booker prizewinning debut, The White Tiger." 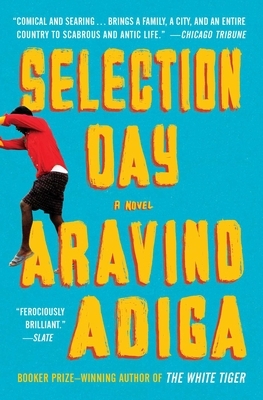 "Selection Day is, by any judgment, top-rate fiction from a young master... Adiga’s plot is gripping." "Sensually told and unpredictably plotted... Adiga's prose has a bustling energy that makes it highly readable." "A captivating and sensitive coming-of-age story that tackles various new themes: the confounding nature of sexuality; the darkness that accompanies excellence and achievement... Adiga’s characters, like his settings, are getting more complex with each book, and this complexity makes his indictment of the contemporary world all the more urgent and convincing." "A master class in integrating character and landscape... Peppered with dashes of humor, this dark and unflinching story is an unqualified triumph." "Brilliant, raw energy ricocheting off of every line."